Saint Theodore, one of Russia’s greatest naval heroes of the eighteenth and nineteenth centuries, was born in 1745. The unvanquished Admiral was the terror of his country’s enemies, and the deliverer of those whom the barbarians had taken captive. 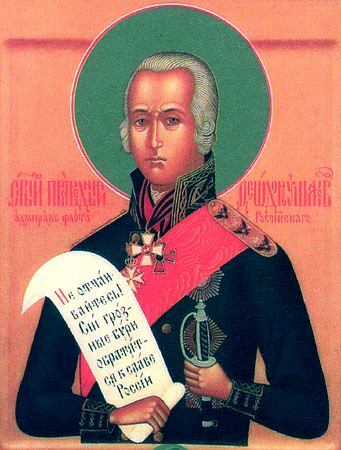 He served during the Russo-Turkish War (1787—1791), and also fought against the French. Although he fought many naval battles in the Black Sea and in the Mediterranean, he never lost a single one, and he was never wounded. Saint Theodore once visited the Greek island of Kerkyra (Corfu), where he venerated the relics of Saint Spyridon of Tremithus (December 12), and gave support and encouragement to the Orthodox Christians in that place. Since his naval reforms were unpopular with his superiors, Saint Theodore was forced to retire in 1807 by Tsar Alexander I. Having neither wife nor children, the admiral settled in the town of Alekseevo near the Sanaxar Monastery, where he regularly attended services on Sundays and Feast Days. During Great Lent he would stay in the monastery, fasting with the monks and attending the services. Igumen Nathaniel of Sanaxar regarded Saint Theodore as “a neighbor and a significant patron” of the monastery. In addition to his generous gifts to the monastery, the admiral frequently gave alms to the poor and needy. He never sought earthly glory or riches, but spent his life in serving God and his neighbor. Saint Theodore died in 1817 at the age of seventy-two. After navigating the sea of life with all its storms and struggles, he entered the calm harbor of eternal rest. He was buried at Sanaxar Monastery beside the church. The monastery was returned to the Russian Orthodox Church in 1991, and Saint Theodore’s grave was found in 1994. Saint Theodore was glorified by the Orthodox Church of Russia in 2004, and a reliquary in the shape of a naval vessel was made to enshrine his holy relics. The holy Admiral Theodore should not be confused with his relative Saint Theodore (Ushakov) of Sanaxar Monastery (February 19 and April 21), a monastic saint who lived from 1719 to 1791. You were an invincible supreme commander of the Russian realm, / Destroying and setting at nought the malice of the Moslems / And seeking neither worldly glory or riches, you served God and your neighbor. / Pray, O holy Theodore, that victory over the enemy be granted our army, / That our homeland may abide in unshakeable piety / And that the children of Russia may be saved.